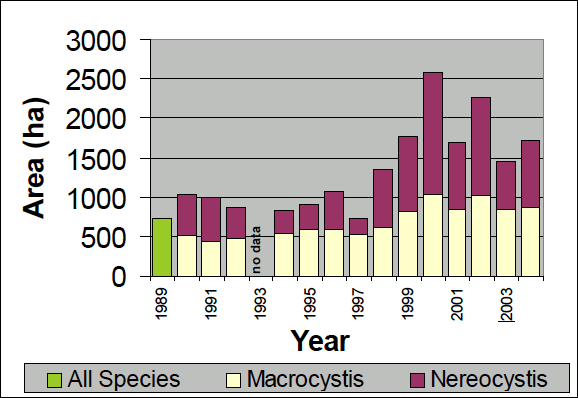 Kelps are characterized by a highly dimorphic lifecycle consisting of a large diploid sporophytic (bed-forming) phase and a microscopic haploid gametophytic phase. 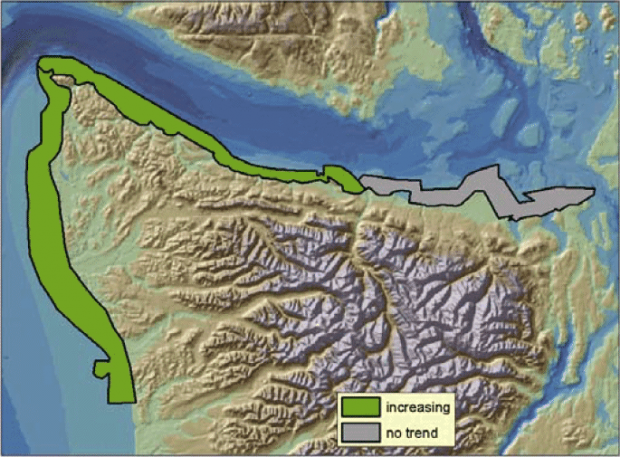 In the Puget Sound region, bull kelp (Nereocystis luetkeana) occurs throughout Puget Sound and the Strait of Juan de Fuca, while the distribution of giant kelp (Macrocystis integrifolia) is restricted to the Strait of Fuca (Berry et al. 2005, Mumford 2007). 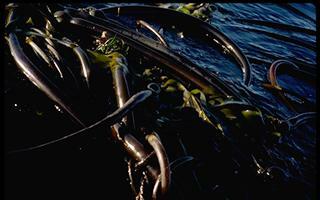 Both form conspicuous floating canopies, or kelp beds. Sporophytes of Nereocystis are annual or semi-annual, whereas sporophytes of Macrocystis are perennial, persisting for several years. 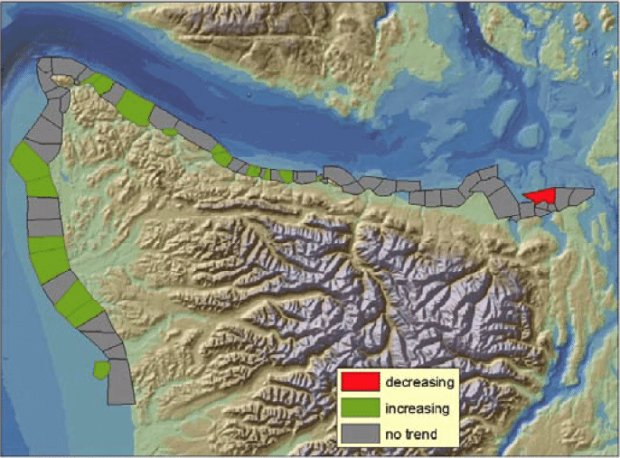 In addition to these dominant bed-forming taxa, numerous species of understory (non-floating) kelp occur in subtidal habitats, many of which are present in southern and central Puget Sound (Mumford 2007). 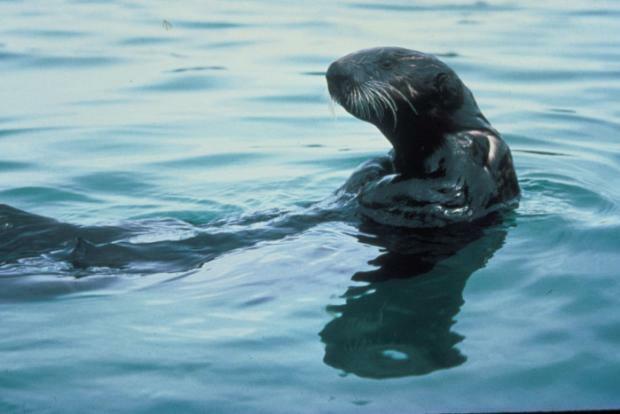 Due to their proximity to shore, kelps are likely to be subjected to anthropogenic impacts such as pollutiondischarge, nutrient influxes from urban and agricultural sources, increased turbidity, and increased rates of sedimentation (Dayton 1985, Mumford 2007). These can alter photosynthetic performance and growth of sporophytes and prevent settlement, growth, and reproduction of microscopic gametophytes. 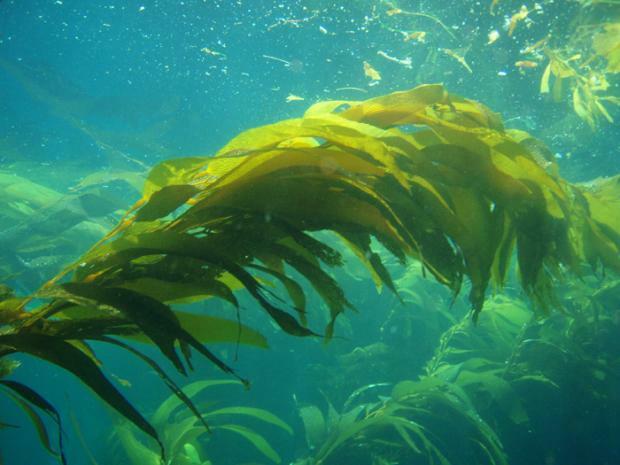 Toxic contaminantssuch as petroleum products are known to damage kelp by lowering photosynthetic and respiratory rates in meristematic tissue (Antrim et al. 1995). The Puget Sound Science Review builds upon and adapts work completed as part of the Puget Sound Partnership’s April 2011 Puget Sound Science Update, a document "synthesizing existing, peer-reviewed scientific information on specific topics identified by policy leaders [Puget Sound Science Update Synthesis 2010]."